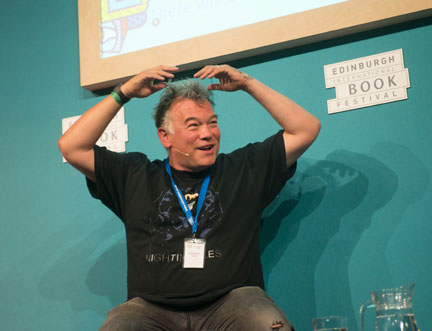 A feisty chat between Ian Rankin and Stewart Lee at the Book Festival saw the blockbuster crime novelist and revered comic trade insults, anecdotes and peculiar allegations about George Osborne and stationery items. Also performing at the Stand is Lee’s wife and fellow comedian Bridget Christie, for whom he also had affectionate words. “If I wasn’t married to Bridget Christie, she would be one of my favourite comedians, and I would be trying to marry her,” he said. “It’s less awkward than if she was terrible.” While the couple might garner material from their real life together – “A lot of what she finds funny is ridiculous things that have happened to me; any pain that I endure” – they have not yet created a show together. One may evolve one day, Lee said, about their honeymoon, which they spent on Shetland – in December. “We didn’t realise how little there was there,” marvelled Lee, “or how dark it would be.” Shetlanders, prepare to feel indignant, but beware: any online trolling of Stewart Lee will only feed his future act.